Prime Beef, Seafood, Wine & Spirits. Overlooking Jackson Street. 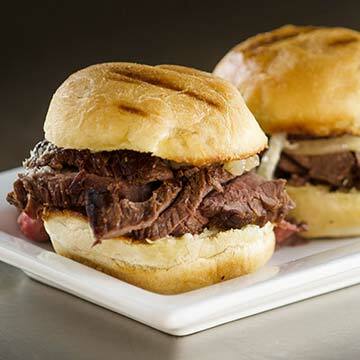 Check out our brand new Bar Bites menu Mon – Sat from 4 – 6 p.m. in the bar. Richard Shapley opened the doors to Ely's Restaurant & Bar in 2008 with a commitment to serving "mouth watering cuts of beef and fresh seafood, in a contemporary, upscale atmosphere." After many years of devotion to Madison County, Ely's word still stands strong and the promise to its neighborhood and home continues to grow stronger. Locally owned and operated, Richard says, "Our service and friendships go hand in hand. It simply comes naturally because we love serving our friends and neighbors." Named after my grandfather, Ely Shapley of Greenville, Ely's Restaurant and Bar was established in February 2008 with an emphasis on top quality food and service in a comfortable fine dining atmosphere. 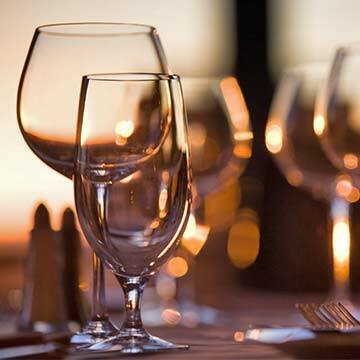 We know you have many dining options in the area and are honored you chose to spend your evening with us. You may book reservations by phone, our online reservation form, or OpenTable. All reservation requests must be confirmed by Ely’s staff. Note: This form is not for reservation requests. For parties of 9 or more or to make a private dining reservation, please call 601.605.6359 Monday – Saturday. All reservation requests will be confirmed by an ELY’s representative (confirmed either by phone or email). After 4:00 pm, please call for same day reservations. New Year's Eve: Reservations only accepted by phone or OpenTable. Reservation Time* hh:mm 5:00 p.m. 5:15 p.m. 5:30 p.m. 5:45 p.m. 6:00 p.m. 6:15 p.m. 6:30 p.m. 6:45 p.m. 7:00 p.m. 7:15 p.m. 7:30 p.m. 7:45 p.m. 8:00 p.m. 8:15 p.m. 8:30 p.m. 8:45 p.m.
For parties of 9 or more or to make a private dining reservation, please call 601.605.6359. After 4:00 pm, please call for same day reservations. 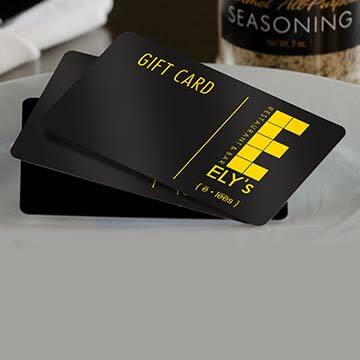 Give the gift of a great evening at Ely's Restaurant & Bar! Our gift cards are perfect for birthdays, holidays, and special occasions. Gift cards can be purchased in our restaurant or online. 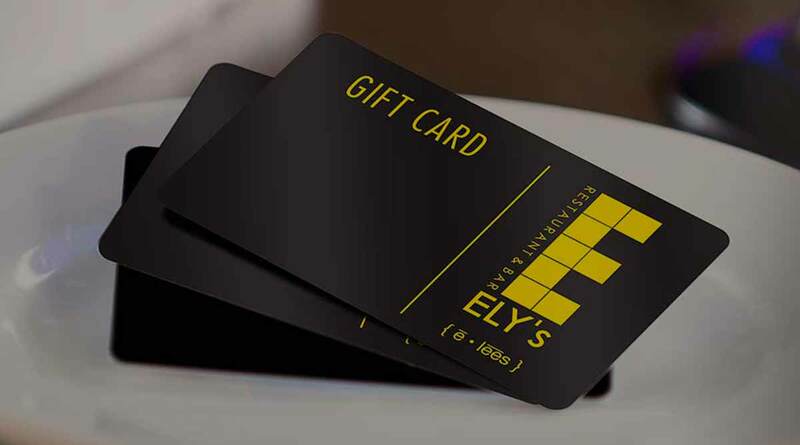 ELY's is not responsible for lost or stolen gift cards. Want to know about upcoming featured menu items, local art exhibits, or food and wine tastings at ELY's? Stay in touch by filling out this quick form. We will keep you informed about what is going on. Required fields are indicated by an asterick (*). Use this form after completing checkout to include a personalized message with your gift cards. We still have dates available! 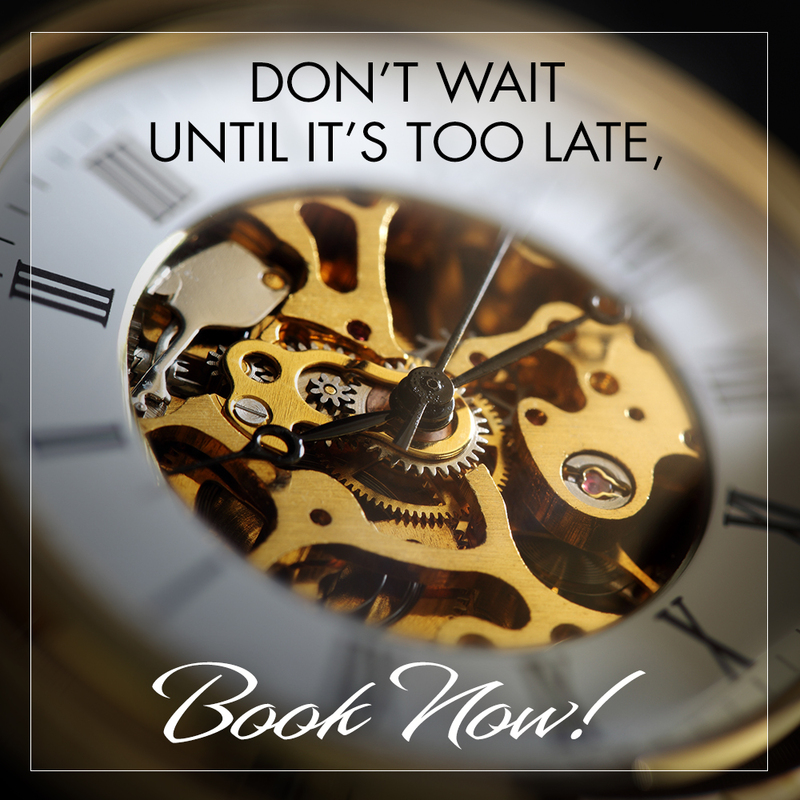 Visit our private dining page for more info or give us a call at 601-605-6359.